An advanced stage/standalone instrument with a suite of compelling studio integration features. Deadmau5 can be seen using the Virus TI2 through this studio session video. "I use the TI2—the new one. Personally I think the sound isn’t as complex and fat as the older Virus C. It’s a little bit thinner, so for some tracks I prefer the Virus C. In the studio it doesn’t matter as much because I’m used to working with MIDI and layering things, and that synthesizer [the TI2] is just very easy to use. It’s a brilliant setup, the Virus TI2, but the sound is definitely different. I’ve had it now for about eight months and it’s brilliant—it has a lot of presets that you can really build on." When asked about producing equipment, Hardwell says "I’ve got a Virus TI as hardware synth." It can be seen on his desk in pictures of his studio. The synth can be seen behind his macbook in this video at 1:18:28. DJ Ron: I've got one more techy question for you, it's simple, what's your favorite keyboard to use? Armin van Buuren: I'm a big fan of the Access Virus. Morgan Page on creating his sample pack for Splice: "I started by firing up all my analog synths, pre-amps, and compressors including: Dave Smith OB6, Dave Smith Prophet 08, Moog Voyager, Buchla Easel, and Virus TI2. Once they were stabilized and calibrated/tuned, I started recording various 4-bar chord progressions I thought were compelling." In this photo of Aly & Fila in the studio, a Virus TI2 can be seen in front of their screens. 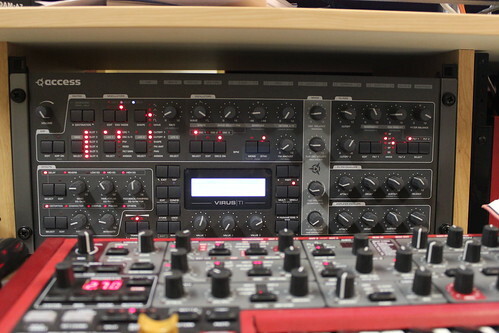 Fehrplay's studio includes the Access Virus TI2 Synth. In his Reddit AMA, he says "I mostly use software synths, but I do have a Virus Ti 2 witch i plug in and use from time to time." As you can see, Eva Shaw uses 2 Access Virus TI2 in your dacks at spinnin studio. A Virus TI2 is visible on Borgore's studio desk while he's "making beats." A Virus TI2 can be seen in this Markus Schulz behind the scenes in the studio video at 1:29 to the right of his keyboard. Frontliner used the Virus to create most of his leads for melodies. You can see the Zatox's Access Virus at the very beginning of this video shared to Facebook. Mike Hawkins' studio setup features, amongst others, the Virus TI2 (below the Moog on the right-hand side of the photo). We also did a lot of passing audio through the filter inputs of the Access Virus module and the Roland JP-8080. edward maya use it, in this photo! When asked what plug in they find themselves using over and over again, Cosmic Gate responded by saying "The Virus TI Desktop". This can be seen at 3:44 of their Interview with BPM-TV. Later in the video they commented that they use it in every song. "Done here for today :) Its a wrap"
"The Virus TI was the first and most important piece of equipment I bought and I still use it in every track. It’s great for bass-lines, pads, leads – so many options and all sounding amazing!" "In addition to favourites like the Access Virus and Roland JP8080, Darren also finds the Novation Nova a useful trance sound source." In this photo on the left we can see Virus TI2. Oh ! just found this pic of the first studio setup. You see the Virus @ 5 sec. on the right. In the beginning of the video we can see on the right Virus TI2. ViruAccess Virus TI2 Desktop Synthesizer can be spotted in the video. At minute 8.38 Prime says: "I love this little box, it's my favourite synthesizer" in reference of the Virus TI2 Desktop. In this Instagram photo, Beat Service shows off his Access Virus TI2 Desktop Synthesizer. Another one of his Instagram photos [seen here](https://instagram.com/p/xopPwZhbcT/?taken-by=beat_service) confirms he owns the desktop module version of the TI2. The patch name on the display reads "Beat 2015". "In the background is the very powerful and versatile Access Virus TI 2 – it’s great for a whole range of sounds," says Willgoose, in [this article](http://drownedinsound.com/in_depth/4148605-planet-gear--public-service-broadcasting). at beginning of this video we can see his access virus ti2 ..
Can be seen on the bottom in the rack. 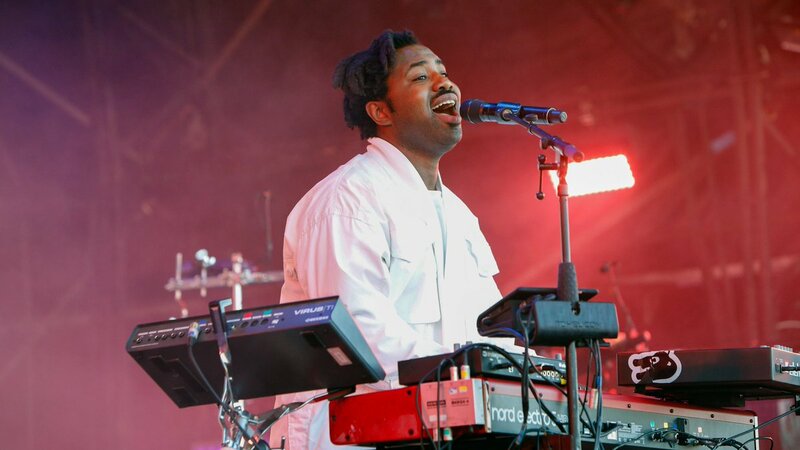 You can see him in his instagram picture working in his studio with the Access Virus TI2 Desktop Synthesizer next to him. In this video you can see SuperStar O with the Virus TI2 at 4:40. It can be seen on his desktop, and can be heard in his music. dj zenn upload a photo on Facebook and show us his virus ti2! Loads of tactile controls make the Virus TI a dream for performers and those who like to tweak ... Continuing Access' policy of free feature updates since 1997. This Synthesizer can be clearly seen at 0:23 in this YouTube video, uploaded by Future Music Magazine. "I’ve always At the start of my journey into sound I worked lots of years together with Marco Bailey in his studio. He had a lot of This has to be THE rrent expectations of equipment that I couldn’t afford back then, so I was always super happy to get into his studio and try out new stuff. At a we used to mix ever wins, which he really certain time he bought an Access Virus B which we used on numerous releases. The sound this device could deliver and addition to the sound especially their big especially those pads which have so much character blew my mind every time. I bought myself an Access Virus C but has to be a little dirty howed me the for some reason or another it never appealed the same to me as the B version. A couple of years ago I bought again the it seems to appeal to TI2 version, which is easily integrated in the DAW environment nowadays. I very quickly got back that feeling of the B I guess it does the version I used to use a lot back then." The Access Virus TI v2 is the second edition of this Desktop Total Integration Synthesizer, and it features 25% more calculating power and a completely redesigned housing. Like all members of The Virus TI platform, the Virus TI Desktop v2 synthesizer is the sublime fusion of a 12-year triathlon in sound research, distillation of user input, and the simple desire to create an exceptional music making instrument. Conceived as a virtual analog synthesizer, the Virus TI v2 grew into a multi-synthesis workstation which seamlessly integrates into your production environment using Access' unique Total Integration plug-in technology. Pros Great sounds. Works as a plug-in. Works as a hardware controller. Works as an audio interface. amazing and warm analog sound. probably the best synth in the world. tweaking capability is pretty big. software and hardware sync is terrible. stuck and crush way above average and its well known for its sickness and malfunctions latency. the hyper saw on this thing is super ! This is probably the most over engineered synth in the world. Worth the investment. Analogue synthesizers always have that unique sound and I'd love to have one of the best in my studio. Bass, Leads, Pads... I use this in many different ways. The Result? Allways pure awesomeness. If you are a trance producer, this is essencial...If you have the knowledge you can make nice sounds for trance in plugins, but just from the synthesis student point of view, the virus sounds library have great classic trance sounds, and you can learn a lot about sound design just *reverse engineering the presets. EDM... couldn't be without of it. it is good enough. but sometimes error and uncomfortable. virus ti sound is really good. have a lot of FX and FM mode, and can use many modulation. It is the god-synth. One synth to rule them all. I love this one. It is my personal favourite synth of all time. Leads, pads, anything you can think of - It really does create whatever i want to achieve with it! Wonderful synth. The drivers are always updated by Access.